Look Inside Your New Home! 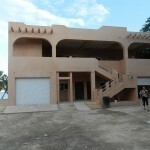 The construction on Playa del Consejo's condos for sale in Belize has been making steady progress. We're excited to announce that all three buildings (Ocean Front, Ocean View and Garden View) in phase one are almost complete. As you step into the development, you'll notice the new look of the condo buildings that are now freshly painted and finished with exterior fixtures. Outside of each building has metal railing bars along the staircase as well as on the verandas and lighting all around. The verandas also have ceiling fans to keep you cool when enjoying the outdoor space of these condos. Work on the grounds is also gaining steam on its way to completion. The cement base for the infinity salt-water pool has already begun emerging from the mud dugout that was previously there. Reclamation has also begun for the man-made beach area on the shore of the development. The interior of the condos are complete giving a true feeling of home. The kitchens have been fully decorated with strong wooden cabinets, beautiful granite counter-tops, and stainless steel appliances (including refrigerator, microwave, stove and dishwasher). The bathroom follow a similar feel with hardwood cabinets and shelves for added storage and granite counters around the sinks. The bedrooms have also been completed with beds and spacious closets. Tiled floors flow throughout the entire condo tying all the rooms together. 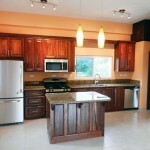 Come choose the perfect condo in Belize for you, only at Playa del Consejo! See the full album of updates here.